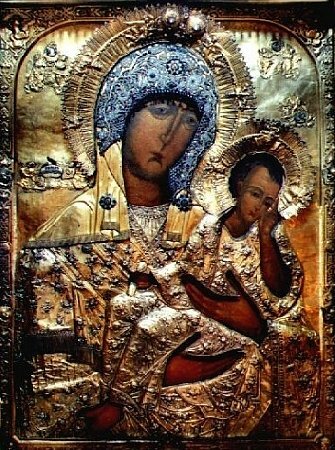 The Starorusskaya Icon of the Mother of God was titled such because for a long time it was located Stara Russa, whither it had been brought by the Greeks from Olviopolis during the very first period of Christianity in Russia. The icon was situated in Stara Russa until the XVII Century. In 1655 during the time of a plague it was revealed to a certain inhabitant of the city of Tikhvin that the pestilence would cease, if the wonderworking Starorusskaya Icon were transferred there, and the Tikhvin Icon sent to Stara Russa. After the transfer of the icons the plague ceased, but the Tikhvin people did not return the icon and only in the XVIII Century did they give permission to make a copy from the Starorusskaya Icon, which on 4 May 1768 was sent to Stara Russa. A feast was established in honour of this event. On 17 September 1888 the original was also returned to Stara Russa and a second festal date established.